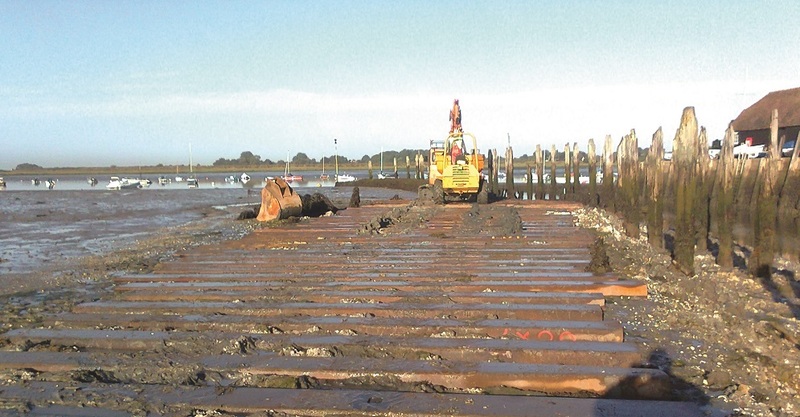 This timber piled revetment wall replacement project took place at Bosham Quay near Chichester in West Sussex. Located in an Area of Outstanding Natural Beauty (AONB) and within a designated SSSI, the site presented many challenges. With its extensive tidal and coastal experience the Mackley team was able to overcome a number of hurdles to complete this project which, as a local landmark, was closely observed during its refurbishment. The project involved the replacement of 110 metres of zig zag breastwork and 51 greenheart piles. Access to the site was across 150m of 1.5m deep silt which presented the main challenge to our site team. To enable access to the works, U section steel piles were placed face down on the silt to form a mat. We were then able to track a 35 tonne movax rig into position to drive the 305 x 305 x 9.3m long greenheart piles. Installation of the sheeters and wailers also involved working in extensive amounts of mud.